After a shocking loss in Miami and then a shameful defeat in Pittsburgh, the Patriots (9-5) are now sitting as the No. 3 seed in the AFC. And though they’re guaranteed to finish no lower than No. 4 as a division winner, Baltimore (8-6) and the Steelers (8-5-1) remain right on their heels. On the flip side, however, the Pats still do have a chance at a bye if they win out AND Houston were to lose to either the Eagles or Jags. Either way, we’re not typically used to seeing such uncertainty in December, as the Pats being a top-two seed is usually a foregone conclusion by now. But things are different this year; the team just suffered two-straight December losses for the first time since 2002 and are now 3-5 on the road this season. Now we get our second matchup of the year with a surprisingly decent Buffalo Bills squad. This time it’s at home, and this time the Bills have a much more talented – albeit more inexperienced – signal-caller leading the charge than they did the last time these two played just before Halloween. Winners of three of their last five contests, the Bills have far exceeded my expectations this year. That’s probably because while their offense has still been pretty terrible, coming in at No. 31 overall, their defense has been absolutely nasty. Currently sitting at No. 2 overall, the Bills D has allowed just 187.4 yards per game through the air in 2018, tops in the league, and they are also the 10th-best team against the run. And since giving up 41 points to Chicago on November 4, the Bills have only allowed just over 18 points per contest in the five games since. On offense, the Bills are a bit of an enigma, and it all starts with rookie quarterback Josh Allen. After spending the No. 7 overall pick in this year’s draft to select him, the Bills were without Allen the first time they played the Pats this season. But since returning just after Thanksgiving, Allen is 2-2 with over 1,150 total yards and seven scores. Allen is proving all the doubters wrong lately with his moxie and strong play. Notice, though, that I said “total” yards; over 30 percent of those yards have actually come on the ground for Allen – with two 100-plus-yard rushing games – and he’s only completed 50 percent of his passes since making his return. So Allen can be a bit of a conundrum; while he won’t hurt you much in the air just yet, he does have the ability to do some damage with his legs. The Pats have actually done a great job of containing mobile QBs this year; outside of the 81 rushing yards they gave up to Mitchell Trubisky out in Chicago, they’ve held others like Deshaun Watson (40), Patrick Mahomes (9), and Marcus Mariota (21) to relatively low numbers on the ground. Still, the Pats continue to be horrendous against the run overall, allowing opponents to average 5.0 yards per carry on the season and coming off of two straight in which they’ve given up over 150 yards on the ground. Allen, along with running back LeSean McCoy, who is expected back after missing last week’s game, could put up some serious rushing totals in Foxborough on Sunday. I’ve said it before, and I’ll say it again: do not sleep on this dude. Fortunately, the Pats should be able to shut down the Bills air game with ease. As I said, Allen still has quite a ways to go as a passer, and besides this Robert Foster kid – who has come out of NOWHERE with three 100-plus-yard games (!) in the last month – the Bills have absolutely nothing at receiver. (No, really, it’s kinda sad.) The Pats also have a pretty stout secondary, and there’s the fact that a rookie QB has never beaten Belichick in Foxborough in the month of December. All I’m saying is that Allen better put on his PF Flyers if he wants any chance of having success on Sunday. (What Does the Offense Do Now? ): Things are looking pretty bleak for the offense right now. After a fool’s gold performance in Miami two weeks ago, Gronk went right back to looking worn out and put up a dud against the Steelers. Brady also looks off – and has for weeks – and now there’s speculation he might legitimately be hurt. Sony Michel has cooled off significantly after a hot start to his career, with James White and Rex Burkhead not really doing much behind him either. And today we find out that the Josh Gordon Experience is over in Foxborough, suddenly leaving the Pats without a true No. 1 outside receiver. Considering there’s two weeks left of regular-season play, they need to figure it out fast, and it all starts this week against one of the game’s top defensive units. 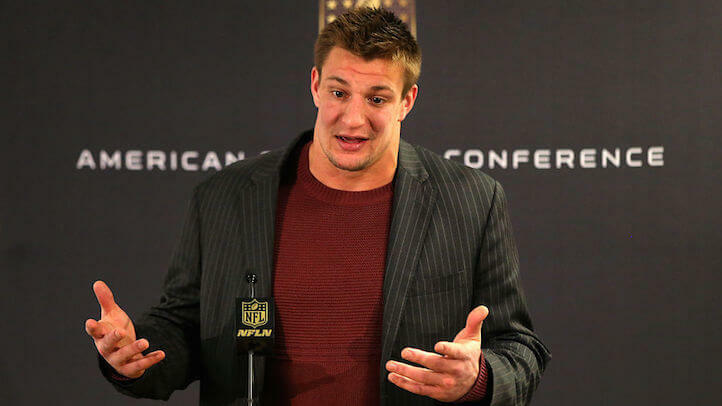 Yeah, Gronk, I agree. That’s pretty much exactly how I’ve been looking at my T.V. these past few Sundays. (Will This Team Ever Stop the Run? ): As mentioned above, the Pats have been one of the absolute worst teams against the run this year. They’ve given up over 115 rushing yards to four of their last six opponents (including three games in which they gave up over 150!). Dalvin Cook would’ve made it five-out-of-six if the Vikings didn’t stop giving him the ball a few weeks ago after he racked up over 90 rushing yards on just nine carries. So not only do I fear that the offense won’t be able to keep up in the playoffs, but the unit won’t even have a chance to get on the field if the Pats’ opponents can simply just run the clock out on them. This week is their last chance to prove their worth against the league’s ninth-ranked rushing offense. I know this preview seems a bit “doom and gloom,” but, come on, can you blame me? After these past two weeks? Also, I’m supposed to have confidence that this offense, in its current state, will blow doors on the second-best defense in the league? Furthermore, the Bills solid running game might actually allow them to hang around and dictate the pace of the contest. These Bills are also tough and pretty resilient; each of their past four games were decided by four points or less. The ONLY reason I am picking the Pats to win this week is because it’s in Foxborough, but it won’t be pretty. The Pats take it 21-17. This entry was posted in Patriots and tagged Bills, Buffalo, Buffalo Bills, Josh Allen, Josh Gordon, Lesean McCoy, New England, New England Patriots, NFL, NFL Week 16 Matchups, NFL Week 16 Odds, NFL Week 16 Predictions, Patriots, Patriots Bills Preview, Patriots Bills Week 16, Pats, Pats Bills Preview, Rob Gronkowski, Tom Brady. Bookmark the permalink.